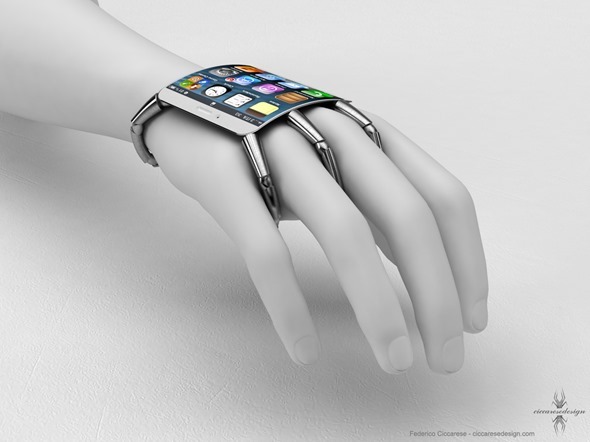 Inspired by a few far out rumors which wondered on devices being made out of curved-glass, designer Federico Ciccarese has created some renders of what an Apple’s wearable device could look like. Ciccarese has made a mockup of an upcoming iPhone 5 that looks rather sophisticated and stunning. Before you move on to the images provided after the break, imagine an iPod nano wristwatch, but much more advanced with an extensive feature set. Looking fairly like a joint-legged invertebrate huge insect, the metallic legs suggested on the images of the device serve to cling to the user’s wrist. 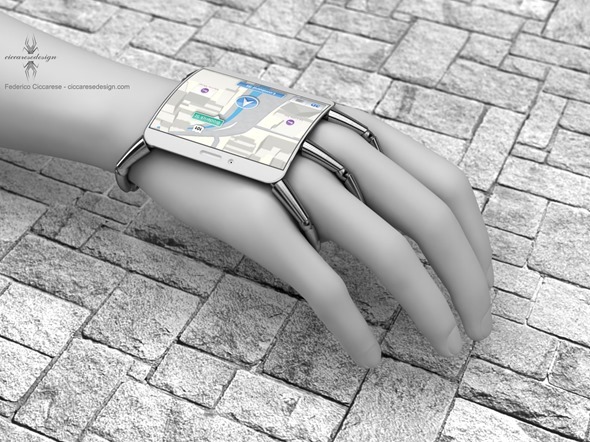 The front three limbs seem to be sitting pretty comfortably between the user’s fingers. Despite the fact that the device looks quite unreal, more like a sci-fi piece of technology, no imagined technical specifications are attached with the images, but the renders do comprise what looks to be a typical home screen-type setup, covered with app icons as well as full-screen navigation happening through the real Apple’s Maps system. We are completely sure that even is Apple is working on some type of new wearable music player or computer-type device; the final product won’t even look similar to this suggested iPhone 5 mockup in any way. However, is still a beautiful concept for those keen on Hollywood arachnid movies! Check the images and a video provided below and do not hesitate to voice up in the comments!